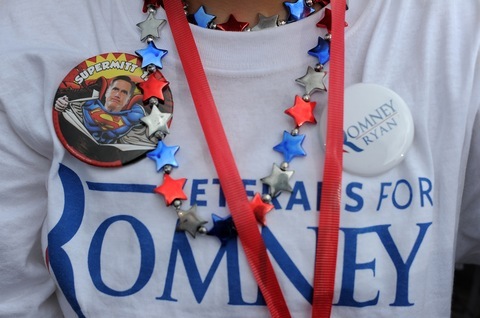 A girl in Port Saint Lucie, Fla., shows her support for Mitt Romney at a campaign event last week. Photo by Jewel Samad/AFP/Getty Images. With four weeks to go until Election Day, Mitt Romney has erased President Obama’s lead in the polls following his convincing debate victory in Denver last week. The Republican presidential nominee now leads Mr. Obama, 49 percent to 45 percent, among likely voters, according to the latest Pew Research Center survey. In mid-September, Pew showed Mr. Obama with a 51 percent to 43 percent advantage. The survey also found that 66 percent of all voters — including 72 percent of independents — thought that Romney did a better job in the debate. Romney’s debate performance has also boosted his standing on certain candidate traits. Forty-seven percent of voters see the Republican as the candidate with new ideas, compared to 40 percent for Mr. Obama. And Romney has drawn even with the president on which of them is a strong leader, with each receiving 44 percent support. Still, voters see President Obama as having more consistent positions on the issues (47 percent to 37 percent) and view him as the candidate who connects well with ordinary Americans (59 percent to 30 percent). The Pew survey isn’t the only one that found Romney on the upswing. USA Today’s Susan Page previewed the Gallup poll to be released Tuesday afternoon during a segment on Monday’s NewsHour. For the first time, Gallup’s daily tracking poll will release likely voters’ preferences this election. That change in methodology will “wipe out” Obama’s steady five-point lead among registered voters, she said. This debate turned things around. It made Mitt Romney more likable, and the leadership is really strong. Margaret, presidential elections are often about who is the stronger leader. But on other questions, there was a significant change. Honest and thoughtful — honest and truthful, rather, Romney’s numbers are up. Willingness to work with leaders from the other party, I think there was a significant tonal change over the past week or so in the Romney campaign. Voters seem to like it. They’re just more open to him these days. The group also discussed what each vice presidential candidate must do at their debate on Thursday. The first presidential debate will flavor their matchup, and the analysts expect Vice President Biden to attack and to avoid gaffes and for Rep. Paul Ryan to defend his budget plan. The Detroit Free Press reports that an EPIC-MRA poll of likely Michigan voters shows Romney trailing Mr. Obama by just three points, 48 percent to 45 percent. The president had a 47 percent to 37 percent lead in the previous survey conducted last month. On Monday’s NewsHour, Judy Woodruff looked at Romney’s effort to put the focus of the campaign back on foreign policy with a speech at Virginia Military Institute. The report was followed by an issue debate between Michele Flournoy, co-chair of the Obama campaign’s National Security Advisory Committee, and Peter Feaver, a professor at Duke University who served on the National Security Council staff during the George W. Bush administration. Feaver explained how Romney would have handled the situation with Iran differently. When it comes to Iran, the president hasn’t laid out a red line that he said clearly he would enforce. When asked to be precise about what it means for Iran not to possess a nuclear weapon — that’s his articulation of the red line — he’s been vague and says he doesn’t want to parse it further. So, I think there’s a certain element of ambiguity about where you would draw the line precisely so as to avoid being trapped by it. But the other point to make is that President Obama has had several years. During those years, the options that he took or the choices that he took narrowed the options that we have today. So one of the reasons why Gov. Romney’s approach to Iran looks similar in some respects to President Obama’s is because Gov. Romney would have done things very differently two, three years ago. Flournoy responded that despite Romney’s rhetoric, there actually was not much daylight between the Republican’s position on Iran and the approach taken by the president. Well, the Iran case is a great example of where the rhetoric would suggest huge differences between the president’s position and Gov. Romney’s position. But when you actually look at what Romney called for, crippling sanctions, positioning our forces to be ready in the Gulf, and keeping the military option on the table, that’s exactly what President Obama has done and exactly what his record has shown. So it’s a case of overdrawing the differences rhetorically, but then actually not being able to say much about what would he — what would Gov. Romney really do differently as commander in chief. Politico’s Mike Allen and Jim VandeHei have another installment of their behind-the-scenes look at the Romney campaign and its recent turn. This time, it was a family intervention led by Ann and oldest son Tagg. Not to be outdone, the Republican National Committee sent out an infographic featuring the Count to criticize Mr. Obama for not talking more about the economy or Libya during recent campaign events. The conservative site Daily Caller reiterates Romney’s Ohio strategy and reports he’s pulling resources from Pennsylvania so he can broaden his efforts in the Buckeye State. The Huffington Post connects the dots between cigarette sales, Russia and Bain & Co.
Bob Lewis of the Associated Press again brings up the Virgil Goode factor in Virginia. Could the Constitution Party candidate from the southwest part of the battleground find enough conservative voters to disrupt Romney’s support? TM Daily Post out of Texas reviews both the deliberate and incidental ties between “Friday Night Lights” and the presidential race. The Ohio Democratic Party ran a full-page ad in the Ohio State University student newspaper attacking Romney for being a fan of the University of Michigan. Left-leaning Public Policy Polling released a pair of new automated Senate surveys Monday. In Wisconsin, Democratic Rep. Tammy Baldwin is up three points over former Republican Gov. Tommy Thompson. In Virginia, former Democratic Gov. Tim Kaine has a seven-point advantage over former GOP Sen. George Allen. Kaine and Allen outlined their policy plans in their fourth debate Monday night. The Las Vegas Sun reports that Democrats have expanded their voter registration edge over Republicans in Clark County, Nevada’s largest county. Roll Call’s Daniel Newhauser writes that if it was bad for Blue Dog Democrats in 2010, it could be even worse this cycle. The Wall Street Journal on the fiscal costs of capital punishment and an upcoming ballot referendum that could abolish the practice in California. President Obama will be on the campus of the Ohio State University in Columbus for a campaign event at 5 p.m.
Mitt Romney will have his first event of the day at 1:05 p.m. at the Koch Family Farm in Van Meter, Iowa. From there, the Republican nominee will travel to Cuyahoga Falls, Ohio, for an event with New Jersey Gov. Chris Christie at 7:25 p.m.
Vice President Biden is in Wilmington, Del., preparing for Thursday’s debate. Paul Ryan has no public events scheduled. Michelle Obama campaigns in Virginia, attending an event in Leesburg at 5:20 p.m. and a fundraising reception in McLean at 7:30 p.m.
Jill Biden spends the day in Pennsylvania. Her schedule includes a trio of canvass kick-off events at 12:15 p.m. in Reading, at 2 p.m. in Lancaster and at 5 p.m. in Philadelphia.